In the summer of 1923, Cora and Skipper Beals founded a camp for boys on the shores of Lake Michigan in Glen Arbor and named it Camp Leelanau. Both were on the faculty of Principia College, a Christian Science School, in St. Louis, Missouri. In 1929 the camp’s success prompted some male campers to ask the Beals if they would consider opening a nine-month high school program. 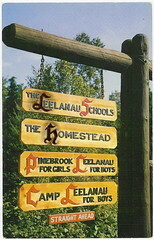 The Beals agreed and The Leelanau School was born. From the beginning, the boys were involved in more than just “preparing for college”. The Beals valued the preparation for life. To them, teaching was an around-the-clock, all-encompassing mission. The boys were taught the value of mental and manual work, spiritual and scientific lessons, and an appreciation for the environments they encountered. These values remain an integral part of our program. By the early 1940s, it was clear that a sister school was needed and The Pinebrook School for Girls was founded. Mr. Beals died in 1942, and the administrative reins passed to Helen and Arthur Huey, both of whom had been involved in the school during the Beals’ tenure. Under the Hueys’ leadership, the Schools grew significantly, while maintaining the same sense of purpose and direction. The Leelanau Experience developed from the wisdom and foresight of these four outstanding educators who, for Leelanau’s first forty years, carefully and lovingly guided the values associated with The Leelanau School.